Fiber Optic cables installed to every home can provide 1,000 Mbps Internet download/upload speeds for $40 a month — for everyone in a city with no data caps, no data throttling and no RF Microwave radiation hazard. California cities strive to be green cities. Fiber optic, not Wireless, delivers a much, much greener broadband solution. Undergounded fiber is the best, but fiber can be strung on Electric Utility Poles — Sonic does it all the time. 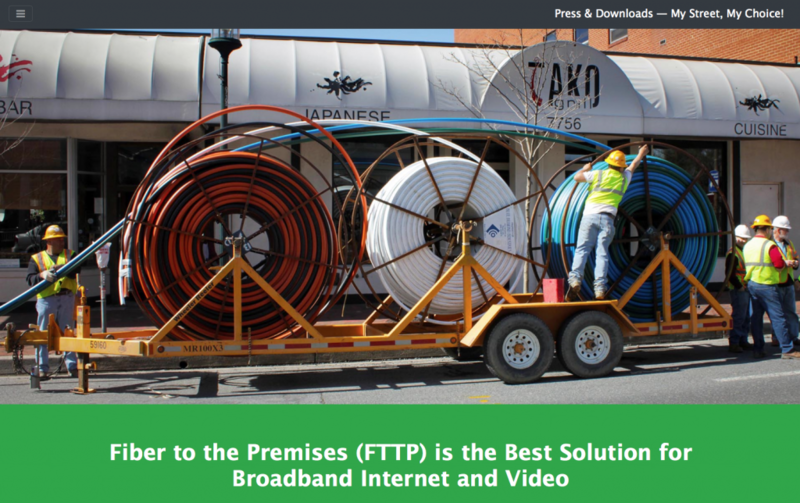 FTTP can leverage the many miles of fiber optic cable that have already been installed by AT&T California, our Title-II regulated State Telecommunications Utility— an installation of fiber that California residents already paid for with charges on Wireline AT&T landline phone bills over the last 25 years. The best solution would be one set of shared Title-II regulated fiber-optic cables to every home, which would create an even, fair and non-discriminatory playing field on which every Internet Service Provider (including Verizon, AT&T, T-Mobile and Sprint) can compete for your dollars, by offering Wireline Television/Video services — a better Wireline television video service than Comcast offers today. That’s real competition and a solution that preserves the residential character of residential neighborhoods. It’s a No Brainer: California cities can claim ownership over the many miles of fiber optic cable installed with public utility money within the city limits — lines that have been fully-depreciated and ignored by AT&T California. This smart action by cities can thwart the devious plan that is being aided and abetted by the FCC and the CPUC: a plan for private Wireless companies to steal this fiber, charge themselves virtually nothing to use it, while charging competitors (like Sonic) very high rates. Cities can stop this fraud and earn revenue to boot. Lots of it. Municipal Wireline broadband over fiber optic cables is much, much better than going through the expense, heartache and legal battles it will take to install four competing Wireless broadband networks in our neighborhoods that will require many thousands, if not millions of ugly, hazardous 4G/5G so-called “Small Cell” cell towers in residential zones. Bruce Kushnick, Executive Director of New Networks. has been a telecom analyst for over 30 years. Kushnick’s 2015 book, The Book Of Broken Promises: $400 Billion Broadband Scandal, is the third in a trilogy spanning 18 years, was placed in the FCC’s public record in 2017, is a must read and is a free download here. Power flux density (PFD) = the amount of electrical power that flows through a unit area: expressed as microWatts (µW) per square meter (m²). 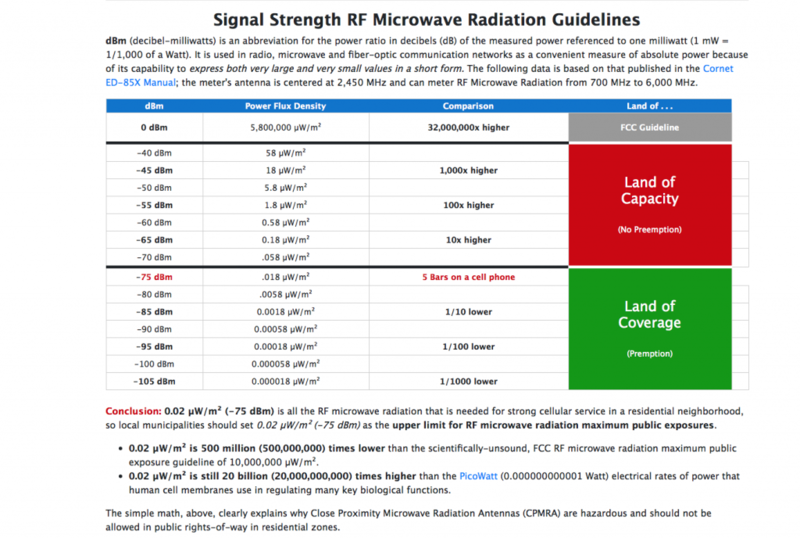 The FCC RF microwave radiation exposure guidelines consider neither the time of exposure nor the total electrical power delivered over time, which is utter nonsense and scientifically unsound. This is more fully explained here: RF Microwave Radiation Counter. dBm (decibel-milliwatts) is an abbreviation for the power ratio in decibels (dB) of the measured power referenced to one milliwatt (1 mW = 1/1,000 of a Watt). It is used in radio, microwave and fiber-optic communication networks as a convenient measure of absolute power because of its capability to express both very large and very small values in a short form. The following data is based on that published in the Cornet ED-85X Manual; the meter’s antenna is centered at 2,450 MHz and can meter RF Microwave Radiation from 700 MHz to 6,000 MHz. Conclusion: 0.02 µW/m² (-75 dBm) is all the RF microwave radiation that is needed for strong cellular service in a residential neighborhood, so local municipalities should set 0.02 µW/m² (-75 dBm) as the upper limit for RF microwave radiation maximum public exposures. 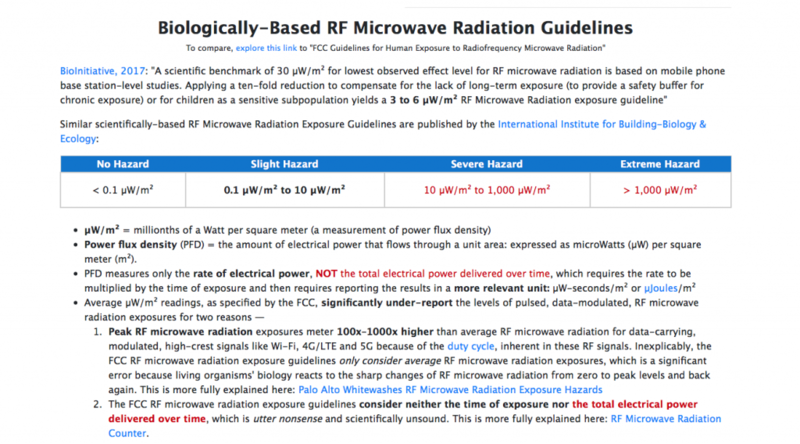 0.02 µW/m² is 500 million (500,000,000) times lower than the scientifically-unsound, FCC RF microwave radiation maximum public exposure guideline of 10,000,000 µW/m². 0.02 µW/m² is still 20 billion (20,000,000,000) times higher than the PicoWatt (0.000000000001 Watt) electrical rates of power that human cell membranes use in regulating many key biological functions. The simple math, above, clearly explains why Close Proximity Microwave Radiation Antennas (CPMRA) are hazardous and should not be allowed in public rights-of-way in residential zones. Conclusion: regulation of the operations of Wireless Telecommunications Facilities was never preempted from local zoning authority. In the penultimate version of the TCA, in Section 107, the words operateand operation appear throughout. 1995 — SEC. 107. FACILITIES SITING; RADIO FREQUENCY EMISSION STANDARDS. (A) Within 180 days after enactment of this paragraph, the Commission shall prescribe and make effective a policy regarding State and local regulation of the placement, construction, modification, or operation of facilities for the provision of commercial mobile services. ;(iv) the administrative costs to State and local governments of reviewing requests for authorization to locate facilities for the provision of commercial mobile services. (iii) any decision by a State or local government or instrumentality thereof to deny a request for authorization to locate, construct, modify, or operate facilities for the provision of commercial mobile services shall be in writing and shall be supported by substantial evidence contained in a written record. (D) The policy prescribed pursuant to this paragraph shall provide that no State or local government or any instrumentality thereof may regulate the placement, construction, modification, or operation of such facilities on the basis of the environmental effects of radio frequency emissions, to the extent that such facilities comply with the Commission’s regulations concerning such emissions. (E) In accordance with subchapter III of chapter 5, title 5, United States Code, the Commission shall periodically establish a negotiated rulemaking committee to review the policy prescribed by the Commission under this paragraph and to recommend revisions to such policy.”. (b) Radio Frequency Emissions. — Within 180 days after the enactment of this Act, the Commission shall complete action in ET Docket 93-62 to prescribe and make effective rules regarding the environmental effects of radio frequency emissions. (c) Availability of Property. 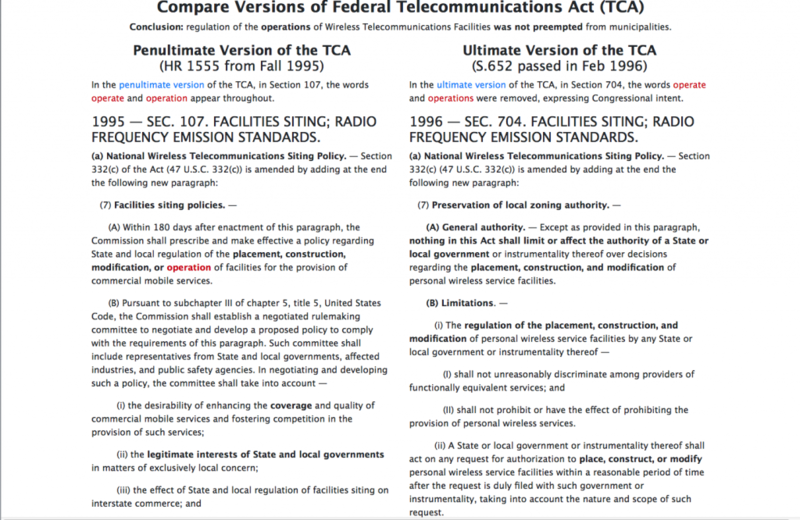 — Within 180 days of the enactment of this Act, the Commission shall prescribe procedures by which Federal departments and agencies may make available on a fair, reasonable, and nondiscriminatory basis, property, rights-of-way, and easements under their control for the placement of new telecommunications facilities by duly licensed providers of telecommunications services that are dependent, in whole or in part, upon the utilization of Federal spectrum rights for the transmission or reception of such services. These procedures may establish a presumption that requests for the use of property, rights-of-way, and easements by duly authorized providers should be granted absent unavoidable direct conflict with the department or agency’s mission, or the current or planned use of the property, rights-of-way, and easements in question. Reasonable cost- based fees may be charged to providers of such telecommunications services for use of property, rights-of-way, and easements. The Commission shall provide technical support to States to encourage them to make property, rights-of-way, and easements under their jurisdiction available for such purposes. In the ultimate version of the TCA, in Section 704, the words operate and operations were removed, expressing Congressional intent. 1996 — SEC. 704. FACILITIES SITING; RADIO FREQUENCY EMISSION STANDARDS. (A) General authority. — Except as provided in this paragraph, nothing in this Act shall limit or affect the authority of a State or local government or instrumentality thereof over decisions regarding the placement, construction, and modification of personal wireless service facilities. (II) shall not prohibit or have the effect of prohibiting the provision of personal wireless services. (ii) A State or local government or instrumentality thereof shall act on any request for authorization to place, construct, or modify personal wireless service facilities within a reasonable period of time after the request is duly filed with such government or instrumentality, taking into account the nature and scope of such request. (iii) Any decision by a State or local government or instrumentality thereof to deny a request to place, construct, or modify personal wireless service facilities shall be in writing and supported by substantial evidence contained in a written record. (v) Any person adversely affected by any final action or failure to act by a State or local government or any instrumentality thereof that is inconsistent with this subparagraph may, within 30 days after such action or failure to act, commence an action in any court of competent jurisdiction. The court shall hear and decide such action on an expedited basis. Any person adversely affected by an act or failure to act by a State or local government or any instrumentality thereof that is inconsistent with clause (iv) may petition the Commission for relief. Recent articles in local and national press. Click to view, then right-click (control-click on Mac) on the image or document to save it to your disk.